Attention all the romantics out there! For something a bit different, send rose petals to your love! Our gift box of red rose petals is a fabulous idea for your sweetheart if you want to spoil them or celebrate an anniversary. Fresh rose petals are also a great, budget friendly alternative to long red roses as well, so if you are looking for a romantic gift that won`t break the budget these are a fab option! Sprinkle them in the bath, scatter them on a bed, or decorate a candlelit table set for two. 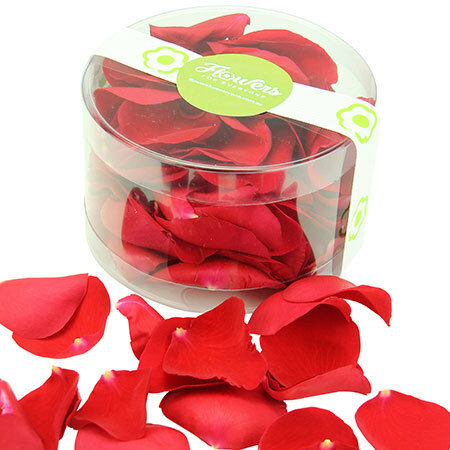 Our red rose petals are a little bit of fun and a LOT of romantic. Use your imagination with this sweet gift of love! Order your red rose petals delivered in Sydney online now, call the team on 1800 66 66 46 or email sales@flowersforeveryone.com.au!